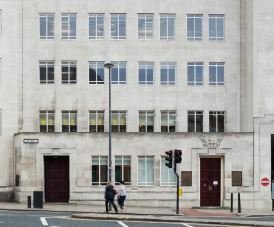 This large building in Aire Street, Leeds offers a range of non-corporate office space that is available to rent in a large spectrum of sizes. Completely furnished with chairs, storage cabinets and desks, these suites are pre-installed with IT wiring, internet and phone points in every room. The Business Centre has a unique interior style throughout the property and boasts some great facilities including a wooden panelled roof terrace and a wide selection of meeting rooms. The reception at the site is manned at all times with multiple personnel and can assist with various duties such as welcoming guests or booking conference rooms. With a formal feel and atmosphere, these serviced offices for let have plenty of communal areas including lounges and kitchen/break out facilities. There is also showering rooms and bicycle storage at the location.